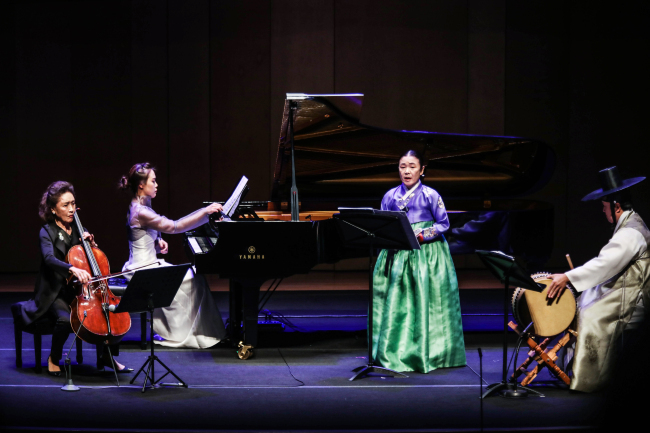 PYEONGCHANG, Gangwon Province -- The PyeongChang Winter Music Festival got off to a rousing start at Alpensia Concert Hall on Wednesday evening with an eclectic program that played on the theme of this year’s festival -- a mix of classical and jazz. Composed by Lim Jun-hee, “Three Sarangga” is a modern reinterpretation of the popular song from “Chunghyangga,” a traditional narrative musical piece about love between a young nobleman’s son, Mongryeong, and Chunghyang, an old courtesan’s daughter. The short three movements of “Three Sarangga” incorporate the traditional beats of pansori -- ranging from the slow jinyang and moderate jungmori to the fast-paced jajinmori and its slightly faster counterpart jeungjungmori -- and melodies adapted from the original “Saranga,” pushing the boundaries of both pansori and Western music. Familiarity with the original “Sarangga” detracted from fully immersing in the modern deconstruction and reinterpretation offered in “Three Sarangga” as one naturally strains to detect the original in the new. Just as one eased into the novelty of “Three Sarangga,” the piece was over. The four performers on the stage, all masters in their own right, together were less brilliant than may have been expected. More natural sharing the stage were jazz pianist John Beasley and saxophonist Bob Sheppard, their exchange of music ideas spontaneous, yet fluid. The fact that they have been playing together for years probably contributed to the ease with which they performed, their virtuosity in full display in the partnership. The concerts at a ski resort represent an opportunity to expand the audience base with programming to appeal to casual listeners of classical music. It helps for the performers to exude charisma that can draw in a skeptical audience. 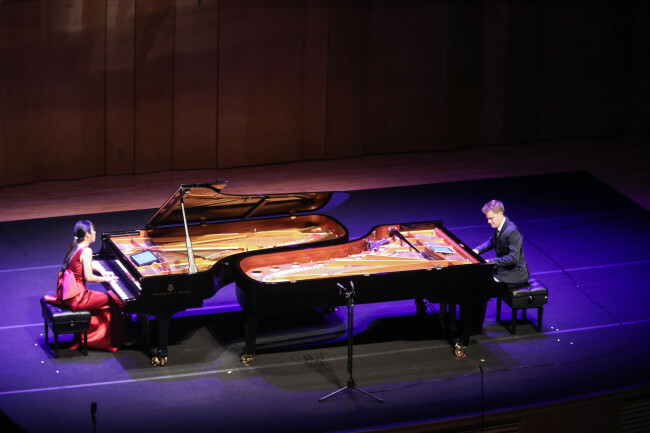 The Anderson & Roe Piano Duo achieved just that to the enthusiastic response of listeners. This year’s PyeongChang Winter Music Festival continues through Sunday with jazz performances by pianist Beasley, Woongsan Band and MONK’estra, as well as classical performances by pianist Son, violinist Lim Ji-young, cellist Isang Enders and soprano Maggie Finnegan, among others. For more information, visit www.gmmfs.com.